THIS LICENSE IS A COPYRIGHT LICENSE ONLY, AND DOES NOT CONVEY ANY RIGHTS UNDER ANY PATENTS THAT MAY BE IN FORCE ANYWHERE IN THE WORLD. THE INTELLECTUAL PROPERTY IS PROVIDED "AS IS", WITHOUT WARRANTY OF ANY KIND, EXPRESS OR IMPLIED, INCLUDING BUT NOT LIMITED TO THE WARRANTIES OF MERCHANTABILITY, FITNESS FOR A PARTICULAR PURPOSE, AND NONINFRINGEMENT OF THIRD PARTY RIGHTS. THE COPYRIGHT HOLDER OR HOLDERS INCLUDED IN THIS NOTICE DO NOT WARRANT THAT THE FUNCTIONS CONTAINED IN THE INTELLECTUAL PROPERTY WILL MEET YOUR REQUIREMENTS OR THAT THE OPERATION OF THE INTELLECTUAL PROPERTY WILL BE UNINTERRUPTED OR ERROR FREE. ANY USE OF THE INTELLECTUAL PROPERTY SHALL BE MADE ENTIRELY AT THE USERâ€™S OWN RISK. IN NO EVENT SHALL THE COPYRIGHT HOLDER OR ANY CONTRIBUTOR OF INTELLECTUAL PROPERTY RIGHTS TO THE INTELLECTUAL PROPERTY BE LIABLE FOR ANY CLAIM, OR ANY DIRECT, SPECIAL, INDIRECT OR CONSEQUENTIAL DAMAGES, OR ANY DAMAGES WHATSOEVER RESULTING FROM ANY ALLEGED INFRINGEMENT OR ANY LOSS OF USE, DATA OR PROFITS, WHETHER IN AN ACTION OF CONTRACT, NEGLIGENCE OR UNDER ANY OTHER LEGAL THEORY, ARISING OUT OF OR IN CONNECTION WITH THE IMPLEMENTATION, USE, COMMERCIALIZATION OR PERFORMANCE OF THIS INTELLECTUAL PROPERTY. 6.2.1. Use Case #1 "Public Catalogue / Open Service"
6.2.2. Use Case #2 "Public Catalogue / Protected Service"
6.2.3. Use Case #3 "Public Catalogue / Protected Service / Sensitive Data"
6.2.4. Use Case #4 "Public Catalogue / Protected Service / Dataset Partially Public / partially sensitive"
6.2.5. Use Case #5 "Protected Catalogue / Protected Service / Dataset sensitive"
6.3.2. 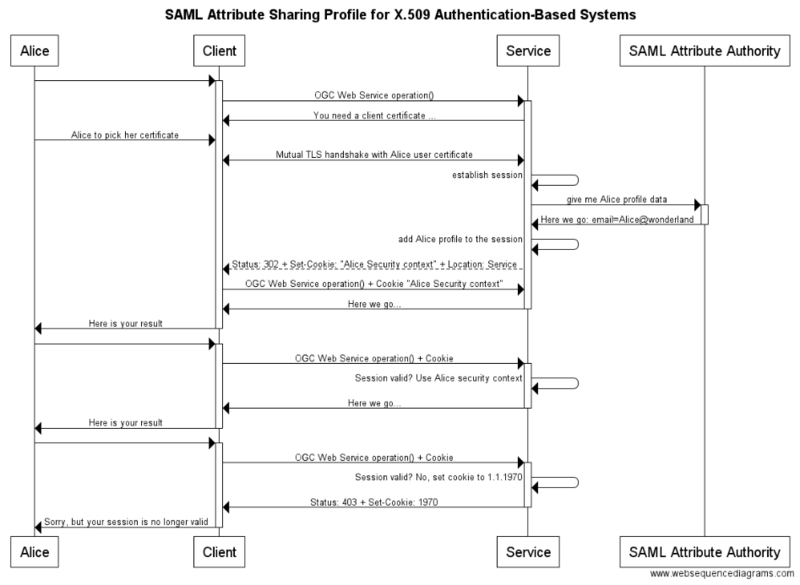 Scenario "SAML Attribute Sharing Profile for X.509 Authentication-Based Systems"
6.3.3. 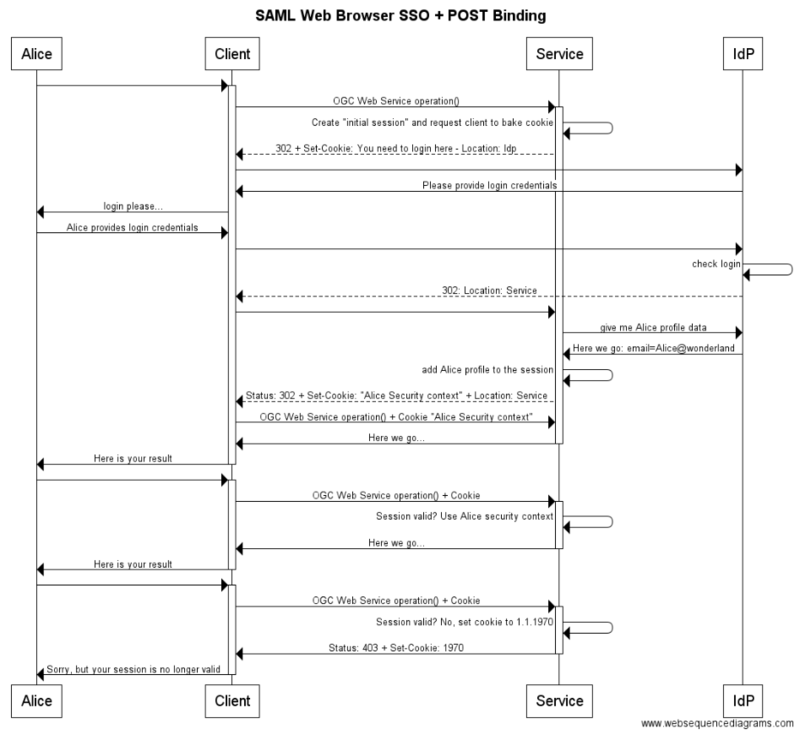 Scenario "SAML Web Browser SSO + POST Binding"
6.3.4. 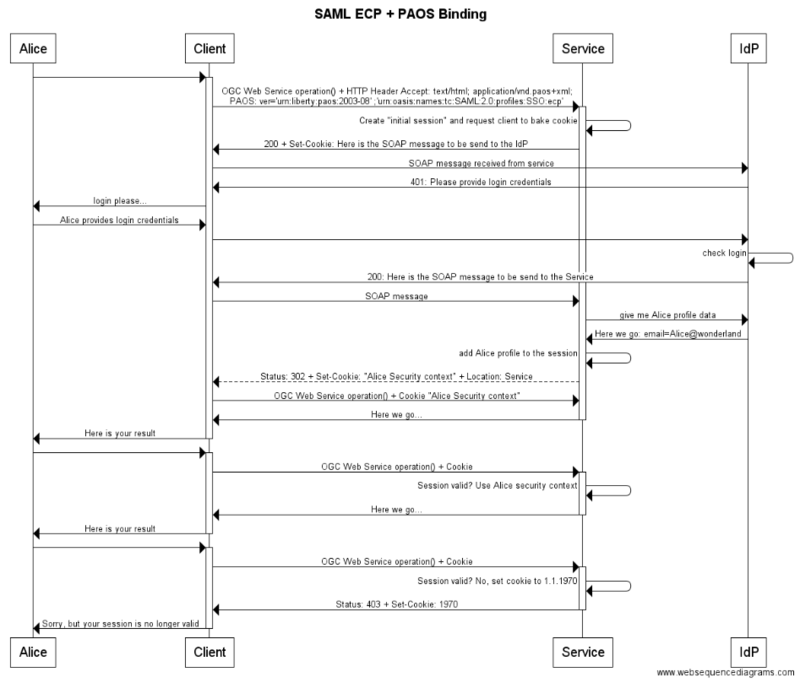 Scenario "SAML ECP + PAOS Binding"
6.3.5. Scenario "SOAP with WS-Security enabled Authentication-Based Systems"
7.1. How can the service tell the client which security is "setup"? 10.3.1. Best Practices Discussion 1 - How to validate XML encoded responses for W*S when the schema is not publicly accessible? The OGC suite of standards address the interoperable exchange of geographic information. The Web Service Implementation Standards define the discovery, delivery, and processing services that make information exchange possible. Common aspects of those Web Service standards have been collected into the OGC Web Services Common standard. While there are multiple versions of OWS Common, and flexibility in how it is applied, this combination of standards does enable interoperability. However, OWS Common neglected to address security. As soon as a service endpoint (an OGC Web Service instance) is secured, there is no guarantee of interoperability. The OWS Common - Security Standards Working Group (SWG) was approved by the TC in September 2015 (http://www.opengeospatial.org/projects/groups/comsecurityswg). It held its first meeting during the December 2015 TC meetings. The objective of this SWG to define an extension to the existing OWS Common to ensure interoperability between a secured service instance and client. This "OWS Common Security Extension" adds content to the standard regarding the implementation of security controls in such a way as to preserve interoperability. These additions will be in two areas. The first extension will provide more detail on the use of the HTTP protocol, particularly as it related to security controls. The second extension will address discovery and negotiation of security controls. This will provide an annotation model for the Capabilities document to enable a service provider to specify the security implemented at a service instance (endpoint). This ER shall serve as the technical background to the OWS Common - Security SWG to ensure that the standard that is to be created is comprehensive and suitable for all OGC Web Services standards, to overcome the interoperability hurdle, and - at the same time - maintain backwards compatibility. Many OGC services are deployed behind security controls. This constrains interoperability to those services designed to work within a common security infrastructure. The Business Value of this Engineering Report is that it provides a way to break that constraint while maintaining the security and infrastructure integrity. It provides the technical background and tests needed to standardize security across OGC Web Services. The use of the findings of this ER, standardized by the OWS Common Security SWG, would then allow secured OGC Web Services to discover and negotiate mutually acceptable security controls. In that sense, OGC Services would again guarantee that access to protected geographic information can be assured. Use cases from the intelligence and commercial sector do benefit from this ER. This ER is vetted by the OWS Common - Security SWG. In particular, this ER provides the technical background for the standardization of the interoperability aspects for OGC Web Services. The SWG has planned to release a normative standard, but also Best Practices and guidance. All of these topics are supported by the ER, but in particular the latter two topics. This ER does have wider consequences for the OGC members as it provides options to ensure interoperability for secured OGC Web Services which extend the current use into other communities, such as commercial uptake. Assuming the approach described in this ER gets standardized by the OWS Common - Security SWG, it is expected that all future OGC Web Service standards address security and ensure compatibility with the approach. This ER provides the technical groundwork of outlining an interoperability framework to enable security on OGC Web Services. It is clear that the suite of OGC Web Services standards is supporting different versions of OWS Common and may define individual behavior that has an impact on how the OWS Common Security Extension must be worded. In particular, the approach is to ensure that a client is capable to extract from a Capabilities document - via security annotations - which service operations it is capable of supporting. The overall scope of this ER is to serve as technical background for the standardization of the "OWS Common Security Extension v1.0" as currently being worked by the OWS Common - Security SWG. During the last OGC Testbeds, various ERs were written that examine the situation of security for OGC Web Service standards. The most recent and dominant ER is OGC 15-022. It provides a comprehensive overview to the problem space "interoperability of protected" OGC Web Services but also introduces an approach regarding possible solutions. For the topic of security, two different origins for future work exist: (i) Security DWG and (ii) Testbed 12 (TB 12). 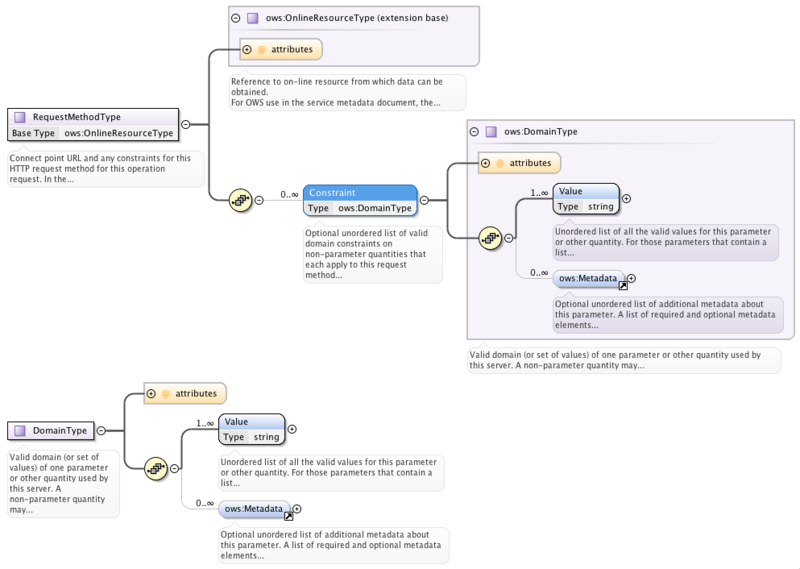 OWSContext with Information Flow / Access Control based on user characteristics. Future work items originating from the work currently undertaken in TB12 are as follows. Client development to parse and use the security annotations introduced for secured services from TB12. This ER lists several examples of security annotations in the Capabilities document. Expansion of the <ows:Constraint/> element to ensure more expressiveness by introducing a CNF (Conjunctive Normal Form) structure. OGC Naming Authority to approve authentication code URNs, the security markup URNs and the URL for the Authentication Code List. Explore the use of annotated Capabilities in a services workflow with secured services. Related to the work described in OGC 16-049 (Testbed-12 Multi-Tile Retrieval ER): the GetTiles methodology described in this ER requires implementing security controls on a service chain if leveraging a WPS. The OWS Common - Security SWG will investigate the security requirements inherent in service chaining and the GetTiles methodology in particular. The availability of one and only DCP type "HTTP" in the OWS Common schema is problematic. For example, there is no way to indicate support for HTTPS. The OWS Common Security SWG will re-visit the Distributed Computing Platform (DCP) concept as originally documented in OGC Catalog 1.0 with the intent of more effectively using that concept to convey security related features and constraints. It is expected that this document may result in the draft standard or input to the informative annex of "OWS Common Security Extension Standard" currently developed in the OGC OWS Common - Security SWG. ISO 10181-2 defines all basic concepts of authentication in Open Systems: it identifies different classes of authentication mechanisms, the services for their implementation and the requirements for supporting protocols. It further identifies requirements for the management of identity information. ISO 10181-3 defines all basic concepts for access control and authorization in Open Systems and the relation to other frameworks such as the Authentication and Audit Frameworks. ISO 10181-5 defines the basic concepts of confidentiality, identifies classes of confidentiality mechanisms and their maintenance. It further addresses the interactions of the confidentiality mechanisms with other services. ISO 10181-6 defines the basic concepts of integrity, identical to the Confidentiality Framework. The current set of OGC Web Services specifications describe a large variety of interfaces to implement a service-type-specific API. All of these interfaces leverage the Hyper Text Transmission Protocol (HTTP). In particular, the existing OGC Web Service specifications describe the use of the HTTP methods GET and POST to interact with the service implementation at a network endpoint. Most of the commonalities regarding the use of HTTP methods and status codes are defined in OGC Web Services Common (OWS Common). Different versions of OWS Common exist. Each version describes sightly different restrictions how to use the HTTP protocol. As pointed out in OGC 15-022, all OGC W*S based capabilities (with the exception of WMS) are based on the OWS Common structure. When implementing security on a service endpoint, it is important to inform the client of the security controls supported. This allows the client to determine which required "security handshake" the service supports and if it is possible to bind to the service in the first place. Obviously, only those service endpoints and operations can be executed for which the client has implemented support. Informing clients of OGC Web Services about security controls is difficult. OWS Common has limitations which inhibit expressing this information. For example, OWS Common only supports the HTTP GET and POST methods. Also, the question arises as to how the service shall advertise the security requirements such as authentication, authorization, integrity and confidentiality. This ER first explores the scope of security protocols and controls that are used in mainstream IT systems. It then addresses the limitations of OWS Common when describing controls for the HTTP protocol. Then, it provides a proposal how the protected service endpoints can advertise security requirements to a client using the OGC Capabilities document. Finally, it illustrates a proof of concept by applying different security conditions to the Capabilities document from various W*S and versions and the results of various Technology Integration Experiments with existing client applications. The Annex contains a complete list of protected services and their annotated capabilities documents. It is strongly recommended to apply security to OGC Web Services based on mainstream Information Technology (IT) standards and solutions. But in order to do so, it is important to understand where OGC Web Services are similar to mainstream IT and where those services are not. The foundation of interoperability for Web Services in general and OGC Web Services in particular is introduced by the OSI/ISO model (Open Systems Interconnection) as standardized in ISO 7498-1 (informative source: https://en.wikipedia.org/wiki/OSI_model). It is important to note that the interoperability introduced (ensured) by the OSI model is independent from the characteristics of the data exchanged. For OGC Web Services, the communication protocol for Layer 7 (application) is limited to HTTP 1.1 as standardized by IETF as RFC 2616. A mainstream-compatible solution of a service and a client (e.g. a Web Browser) can be based on the fact that both are fully compliant. But, for OGC Web Services according to the W*S implementation specifications, no full support of HTTP is required. This has implications for applying security. All OGC Web Services are stateless, which implies that any state must be managed by the client. When applying security controls, usually a security context is involved that can be used to manage access to a secured (protected) service endpoint. Typically, the security context contains (but is not limited to) authentication information about the user. This security context is typically stored at the server side and the client uses some mechanism to refer to it. When managing access to a protected service, this information might be considered. It is therefore relevant, that the client can provide a "pointer" to the security context. Different authentication models implement this pointer differently. For example HTTP Basic Authentication, as standardized in RFC 2617, uses the HTTP Header "Authorization" as the pointer. More complex authentication models require the support of HTTP Cookies as standardized in IETF RFC 6265 (former 2965 and 2109). In terms of confidentiality and integrity, it is recommended practice to constrain the communication to HTTPS to ensure confidential communication between the entities. HTTPS is standardized in IETF 2818 and basically defines the use of HTTP 1.1 over an encrypted communication channel such as TLS. Transport Layer Security (TLS) version 1.2 (which is the de-facto version to use) is standardized by IETF RFC 5246. The ISO 10181 series, which is identical to ITU-T X.81* body of standards, defines a collection of security frameworks for open distributed processing. These standards are part of the ITU-T X-Series Recommendations for Data Networks and Open Systems Communications. While there are many other security frameworks available, the scope and history of the ITU-T (formerly CCITT) makes their frameworks particularly applicable to the Web Services domain. This section provides a summary of these frameworks. An understanding of these concepts will be assumed throughout the rest of this Engineering Report. Many Open Systems applications have security requirements which depend upon correctly identifying the principals involved. Such requirements may include the protection of assets and resources against unauthorized access, for which an identity based access control mechanism might be used, and/or the enforcement of accountability by the maintenance of audit logs of relevant events, as well as for accounting and charging purposes. The process of corroborating an identity is called authentication. ITU-T combines the concepts of identification and authentication into a single framework. Identification asserts an identity for a party in a transaction. Authentication validates that the assertion is correct. For example, a user name asserts an identity. Authentication is only achieved once the password has been validated. The primary goal of access control is to counter the threat of unauthorized operations involving a computer or communications system; these threats are frequently subdivided into classes known as unauthorized use, disclosure, modification, destruction and denial of service. Access control is arguably the most complex of the security frameworks. It typically consists of the authenticated identity of the party requesting access, metadata describing the access restrictions for a resource, and some form of access policy enforcement which governs whether access is granted or refused. Some common forms of access control are as follows. Access control lists: If the requesting party is not on the list, they do not get access. Attribute Based Access Control: Each user is assigned a set of security attributes. Based on those attributes and the security markings on the resource, access is granted or refused. See ITU-T X.509. Secure Token Service: A Secure Token Service makes the access control decision once, then issues a token which grants access to a resource for a period of time. Most of these services use an automated system to make the access decision. OAuth differs for the Authorization Code flow as the request for approving access to the resource is send to the resource owner. This owner typically is an individual. This allows an individual to control access to their resources, even if they do not own or control the service which is hosting that resource. The goal of the Non-repudiation service is to collect, maintain, make available, and validate irrefutable evidence regarding identification of originators and recipients involved in data transfers. Non-repudiation is typically accomplished through a digital signature. A digital signature generates a hash of the message, then encrypts the hash and additional identifying information using the users private key. If they signature can be decrypted using the users public key, and the hash values match, then whoever signed the message must have had access to the users private key. If the private key has been protected, then only the user could have created and signed the message. Therefore they cannot repudiate the message. Many Open Systems applications have security requirements which depend upon the prevention of disclosure of information. Such requirements may include the protection of information used in the provision of other security services such as authentication, access controls, or integrity, that, if known by an attacker, could reduce or nullify the effectiveness of those services. Confidentiality is the property that information is not made available or disclosed to unauthorized individuals, entities, or processes. Confidentiality is commonly achieved through encryption. Encryption can be applied to the resource itself or to the channel the resource is exchanged over. HTTPS, for example, provides confidentiality by running the HTTP protocol over an encrypted transport link. Many Open Systems applications have security requirements which depend upon the integrity of data. Such requirements may include the protection of data used in the provision of other security services such as authentication, access control, confidentiality, audit, and non-repudiation, that, if an attacker could modify them, could reduce or nullify the effectiveness of those services. The property that data has not been altered or destroyed in an unauthorized manner is called integrity. The digital signature discussed above also provides integrity. If the hash algorithm is of cryptographic grade, then the chances of two messages generating the same hash are very low. So if the hash values before and after transmission match, then you can have confidence in the integrity of the message. During the second session at the TC Meeting in Sydney (2015), use cases were identified that are relevant to OGC Web Service security. These use cases illustrate issues such as the following. The discovery of a protected service from a CSW? The discovery of protected data? The binding of a client to a protected service? How are security constraints described in ISO metadata? How are security constraints described in Capabilities documents? The open use case: it’s an open environment and all is shareable. Services are available via a public network (Internet) and service metadata is registered in a public catalogue. ISO Metadata must not include accessContraint elements. Capabilities must not list access constraints. The Business Use Case: a provider wants users to know that there is a protected service registered in a public catalogue. They also want users to know that the content served is protected but not classified. The ISO Metadata indicates that the service endpoint(s) is(are) access protected. The ISO metadata also points to a public version of the Capabilities document. This public Capabilities document includes the content section and describes the content available from the service. The Public Capabilities document also describes the access constraints on a protected GetCapabilities operation. This protected GetCapabilities operation returns additional service metadata which the owner may not want to have publicly available. A Protected Service with sensitive data is registered in a Catalogue on a public network (i.e., the Internet). The ISO Metadata indicates that the service endpoint(s) is(are) access protected. The ISO metadata points to a public version of the Capabilities. The Public Capabilities document does not include a content section. The Public Capabilities document also describes the access constraints on a protected GetCapabilities operation. This protected GetCapabilities operation returns a full capabilities document including content section. A service is registered in a public catalogue. Access to the service as an anonymous user provides knowledge about the non-sensitive data provided. Authenticated users can access knowledge about those data sets / layers that the user is authorized to see. Public metadata / capabilities outline the access constraints content section partially inline (non-sensitive data sets) partially using external links (sensitive data sets). A service that is just providing sensitive information, which is not meant for public / anonymous consumption, is registered in a protected catalogue. Users searching the catalogue must be authenticated. Access Control might additionally restrict the results provided to a user by enforcing the need-to-know principle. The metadata describing the search results from the catalogue can be constructed according to the user’s permissions and therefore might different for users with different permissions / privileges. HTTP Authentication is specified by IETF RFC 7235. It is a challenge-response authentication scheme using HTTP headers and response codes to exchange the challenge and response. The following example illustrates its use. This HTTP Authentication does not require a security context to be saved on the service side. Once valid authentication credentials have been established, the client can include those credentials with subsequent requests using the Authorization header. The authentication schemes supported by RFC 7235 are registered on the IANA HTTP Authentication Scheme Registry (http://www.iana.org/assignments/http-authschemes/http-authschemes.xhtml). Two commonly used authentication schemes are Basic and Digest. Basic authentication credentials are an unencrypted user name and password. Digest authentication also uses a user name and password however the values are encrypted prior to being exchanged. HTTP Authentication is illustrated by the sequence diagram in figure 2. Service-->Client: Code 401: Authentication challenge = "Basic"
Client->Service: OGC Web Service request + Authentication header "alice:secret"
Client->+Service: OGC Web Service request + Authorization header "alice:secret"
TLS client certificate handshake: The client must be able to provide a user (or client application) certificate to establish a secure channel with the service. HTTP response set-cookie: The service requests that the client "bakes" a cookie. HTTP response status code 302: The client must follow the redirect to the new location and - in this case applicable - submit the cookie with the redirect. HTTP request + Cookie: Client must submit the HTTP Cookie with the request. Client->Service: OGC Web Service operation() + Cookie "Alice Security context"
The following example illustrates the use of HTTP redirect, HTTP cookies and HTTPS to leverage the SAML2 profile "Web Browser SSO" in conjunction with the "POST Binding." Service creates "first visit" session and returns HTTP response status 302 + set-cookie: The user client gets redirected to another URL where the user shall login (IdP). IdP HTTP response status 302: Redirect the client back to the Service. Service returns HTTP response 302: Redirect to itself to fetch the cookie and update the session (e.g. with user profile information). The following example illustrates the use of HTTP specific headers, HTTP cookies and HTTPS to leverage the SAML2 profile "ECP" in conjunction with the "PAOS Binding." The client submits ACCEPT header: SAML ECP specific value "Accept: text/html; application/vnd.paos+xml; \nPAOS: ver='urn:liberty:paos:2003-08' ;'urn:oasis:names:tc:SAML:2.0:profiles:SSO:ecp'" indicates to service that the client is capable of the SAML2 ECP handshake. The service responses with a SOAP message + Set-Cookie. Client must submit HTTP cookie with requests. The following example illustrates the use of security on the application layer by applying "WS-Security" to SOAP <Header> elements. The SOAP security enabled endpoint acts as a reverse proxy to an unsecured WFS. 1) The security facade inspects the received SOAP message to be compliant with the WS-Policy in place for the service. 2) For example, the validity of the digital signature for the Digest Username/Password token included in the header. 3) The security facade strips off the SOAP message parts and forwards the content of the <Body> element to the unprotected service. 4) The response from the WFS is included inside a SOAP envelope as the content of the <Body>. 5) Outbound message security is applied as specified in the WS-Policy. Interoperability to secured services requires that the calling application, aka the client, understands which security mechanism(s) is(are) implemented at the service and is able to technically "deal" with the advertised requirements. The vehicle to ship the information from the service to the client is capabilities with security annotations. As described in OGC 15-022, basically two different sets of metadata exist, as below. OGC Capabilities: This XML document is used by the client application(s) to bind to an OGC Web Service. It is therefore the appropriate place to include security annotations in machine-readable format that describe the security model implemented at the service instance. ISO Service Metadata: This XML document is retrieved from a Catalog and supports end users in searching for applicable services but also developers to craft workflows. An ISO Service Metadata instance document is typically not suitable to actually bind to an OGC Web Services. It should outline procedures that users can follow to obtain required certificates, token, etc. to execute a protected service endpoint. Different types of OGC Web Services provide different patterns how to receive a capabilities document. OWS: The GetCapabilities() operation is common among all services. SOAP OWS: For a service which has SOAP security (WS-Security) instrumented, the capabilities document must not be used to provide the security metadata other than pointing (referencing) to a WS-Policy. The GetWSDL operation (if available) must be used to obtain a WSDL document that defined the SOAP message structure and uses WS-Policy to outline the regulations for the SOAP message including crypto and cipher restrictions. For the use of annotated capabilities to express the security conditions on the service endpoint, it is important that such a capabilities document does not crash existing clients that do not know about the annotation. This is important as rolling-out the security annotations will take place in an existing environment and the ability to update services one by one and use existing clients and new clients that understand the annotated security marking in the capabilities is essential for this concept to have a chance of getting used. This backwards compatibility can be achieved when the security annotation in the capabilities file does not invalidate the structure of the capabilities document. In other words, for each version of a W*S capabilities document, it must be possible to define the security conditions. The proposal, introduced in OGC 15-022, is to leverage an existing element from the OWS common (any version) schema: ows:Constraint. 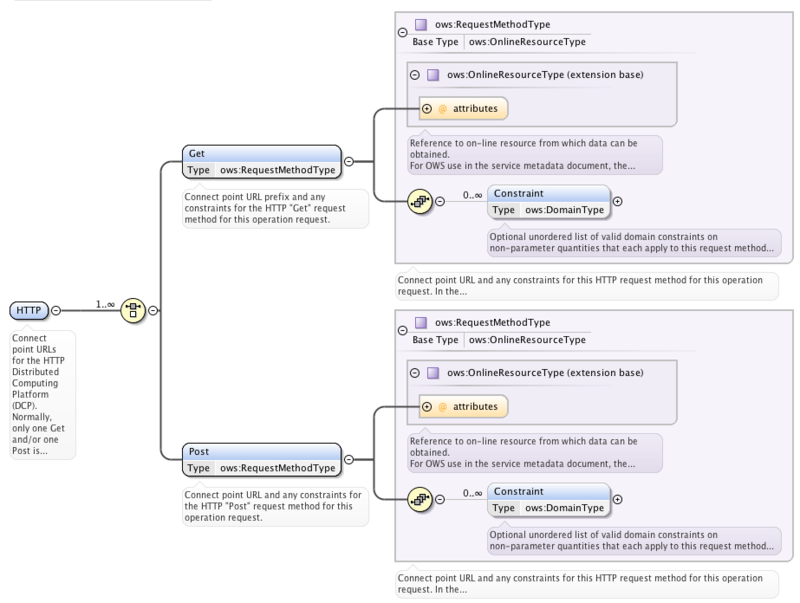 By doing so, the structure of the annotated capabilities document is still valid against the schema. Because the Web Map Service does not structure the Capabilities document using the OWS Common schema, all versions of WMS require an individual solution. It is important to note that the WMS 1.1.1 structures the capabilities based on a DTD and WMS 1.3.0 uses its own schema. The following figure illustrates the use of the annotated capabilities document. note left of Client: The client has produced a list of secured operations\nwhich are supported regarding the security\nconditions. The user can choose from these operations. For WMS 1.1.1, the capabilities are structured using a DTD. For WMS, is necessary to define a mechanism that enables a similar annotation method as provided from OWS Common. For a WMS 1.3.0, the option is to define a specialization of the _ExtendedCapabilitiesElement. For a WMS 1.1.1, the capabilities is structured by a DTD which requires to define a proper extension mechanism via the VendorSpecificCapabilities element. For OWS Common 1.0.0 schema, it is only possible to list the ows:Value element inside the constraint element. This affects the CSW and the WFS 1.1.0 as these version use the OWS Common 1.0 schema. It is important to point out that the element ows:Constraint is optional but may occur unbounded. The use of multiple ows:Constraint elements within the same OperationsMetadata element shall be interpreted as a logical AND. This procedure, to normalize the logical OR into a DNF of (Get | Post)+ elements is required as we are not allowed to define a new structure because of backwards-compatibility. An annotation with security shall be done per service operation using the ows:ValuesReference element. The ows:Reference attribute shall point to the authentication codelist, the authorization policy or the WS-Policy. As outlined in OGC 15-022, it is important to provide information on security constraints like authentication, authorization, integrity and confidentiality. Within TB12, the following URNs have been defined with the following meaning. urn:ogc:def:tb12:security:policy refers to a WS-Policy that defines the security constraints for a SOAP envelope of a SOAP security enabled service endpoint. From OWS Common XSD, the ows:ServiceMetadata element contains the ows:Constraint element, which can occur unbounded. It is therefore possible to use one or multiple ows:Constraint element(s) to express one or multiple security constraints per service operation. It is important to note that the logical AND must be applied for all ows:Constraint elements. The authentication code list, referenced from the security identifier for authentication (urn:ogc:def:tb12:security:authentication), shall be maintained by the OGC OWS Common - Security SWG. In order to ensure backwards compatibility, the code list must never change for existing items and no items can ever be removed. In other words, the SWG can only add identifiers. The process is that any interested party can issue a CR to the SWG for adding a new identifier. Once the SWG has accepted the request (and clarified the identifier and the text), the OGC naming authority must approve the identifier URN. It will then be populated by OGC staff to become available online. The SWG must also decide the URL via which the normative OGC authentication code list becomes available. The structure of the OGC authentication code list shall be a ISO format based on the gmx namespace: http://www.isotc211.org/2005/gmx. The namespace and the definition can be retrieved from here: https://cdn.earthdata.nasa.gov/iso/gmx/1.0/. This enables the seamless use of the authentication code identifiers in ISO metadata. It is important to note that the GMX code list structure supports multiple code spaces. It is anticipated to use existing identifiers, like OASIS defines URNs for SAML. The namespace OGC shall be used to create unique identifiers for all authentication schemes that do not have a unique urn identifier from another standardization body. In that sense, OGC defines a URN for the HTTP Authentication methods as defined in IETF RFC 2617. More examples of capabilities including security annotations are available in a later chapter. In case that a service endpoint has security implemented, the client can only use the Capabilities document and its security annotations to determine compatibility if the instance document could be obtained either (i) publicly or (ii) via a common security mechanism implemented by all clients on the planet. In that sense, chances are that the annotated version of the Capabilities for a protected service must be publicly available. In this case, the client can read and compile the security annotations per operation and filter supported security settings. use URL references to the content definition: of course, these links would be protected so that for obtaining a list of offerings, the user client must overcome the security constraint. 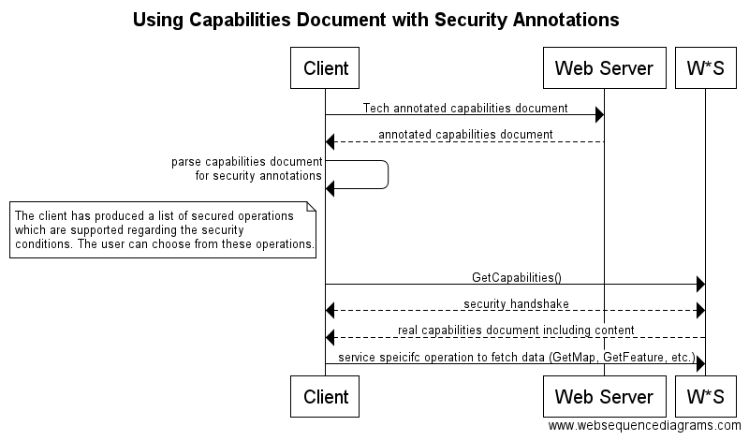 In any case, the client must always fetch the full capabilities document via the GetCapabilities operation, outlined in the publicly available capabilities document comprising of the security annotations. The following Capabilities document is an example for a WFS 1.1.0 capabilities document that does not contain any FeatureType information; just the Operations Metadata. This approach can be used in case the WFS is serving feature types that are not intended for public awareness. The following Capabilities document is an example for a WMS 1.3 capabilities document that does not contain any Layer information; just the Operations Metadata. This approach can be used in case the WMS is serving layers that are not intended for public awareness. A well defined list of authentication methods, defined and maintained by the OGC Naming Authority, guarantees that interoperability can be implemented between a service implementing the method and a client challenging the method. The use of well defined authentication methods, collected in a controlled list, provides the benefit that interested parties can write OGC extensions or profiles that collect relevant methods together for a particular installation. As an example, a commercial provider likes to ensure that in his Federation, all Web-based and desktop applications are SAML enabled. A profile of the OWS Common Security Extension would reference the authentication methods SAML ECP as mandatory to be implemented. In another community, perhaps the mobile two factor authentication is relevant and therefore that community profile would mandate other entries from the code list. Some standardization organizations have established URNs or other unique identifiers for authentication methods. It is the idea to use all existing authentication identifiers established by other standardization bodies. OGC must only create identifiers for those authentication methods that do no have a unique identifier already. It is the idea to base the authentication registry on the ISO GMX structure, which enables the use of code spaces. This enables to refer to authentication method definitions from other standardization bodies and separate the OGC code space to create relevant URNs via the OGC Naming Authority. The IETF seems not to have established unique identifiers for the authentication methods defined in RFC 2617: HTTP Basic and Digest Authentication. Also, RFC 5246 does not define an identifier for client side certificate. The Authentication Codes used in the Authentication Code List are based on URNs that are not approved by the OGC Naming Authority! For standardization, the OGC Naming Authority must approve the Authentication codes and the security identifier URNs as well as the official URL for the Authentication Code List. It is expected that the OWS Common Security SWG will request the URNs from the Naming Authority officially. In order to facilitate the different versions of OWS Common (1.0.0 does only allow string values were as 1.1.0 and 2.0 allow ValuesReference) it is possible to just provide the urn value or a resolvable link. parameters of the interaction and the consent of the parties. with the HTTP Redirect, HTTP POST and HTTP Artifact bindings. the providers for the principal, subject to the parameters of the interaction and the consent of the principal. The benefit of using a GMX codelist is that it can also be used to annotate ISO 19139 metadata for services. But evaluating options for annotating ISO metadata is outside the scope of TB12. The proposed approach is to annotate the service capabilities document using the ows:Constraint element from the OWS Common XSD for any server where the capabilities structure is based on OWS Common. For WMS 1.3, the use of the _ExtendedCapabilities element is proposed. The use of the ows:Constraint element does provide different options on how to annotate. The following examples of service security and the corresponding annotation examples shall help to understand and verify that the proposed approach for security annotation is comprehensive. urn:ogc:def:tb12:security:layer4 is used to express TLS or SSL requirements. The service is following the W*S approach (basically HTTP but no SOAP messages). For SOAP security enabled service instances, all the security specific conditions are typically captured in the SOAP message. The SOAP message can either be a service input or output message. As the SOAP message structure is XML, one can apply all security related conditions that can be put on XML: a) Integrity by applying W3C XML Digital Signature; and b) Confidentiality by applying W3C XML Encryption. The annotation for SOAP enabled services shall be done via a WS-Policy, which can be referenced from the Capabilities document using the OWS:Constraint element with the identifier "security:policy" or be inline to the service instance capabilities file. Both approaches involve a WS-Policy which can be used for creating client side code from the WSDL and at runtime from the capabilities document to apply/verify required security conditions are applied to the SOAP envelope. For annotating a secured SOAP service, only one example is necessary as all the individual conditions are expressed in the associated WS-Policy. The following example illustrates how to reference a WS-Policy from the security annotation inside the Capabilities document. The following examples illustrate this procedure. The service endpoint uses the protocol scheme “https” and the requirement is that the client supports SSL 3.0 and TLS v1.2. These security constraints must be normalised to a DNF as ( (TLS 1.2 AND Authentication) OR (TLS 1.2 AND Client Certificate) ) which requires that the ows:Get element is duplicated. Each ows:Get element expresses one possible option for the client to interact with the service endpoint. These security constraints must be normalized to a DNF as ( (TLS 1.2 AND Authentication for Get) OR (TLS 1.2 AND Client Certificate of Post) ) which requires that the ows:Get and ows:Post elements are used accordingly. Each ows:Get or ows:Post element expresses one possible option for the client to interact with the service endpoint. The security annotation for WMS is possible via the definition of a specialization of the _ExtendedCapabilities element, which is abstract in the WMS 1.3 capabilities schema. The following examples illustrates the use of the extension. This section summarizes topics that are required to be submitted as Change Requests (CRs) to OGC, requirements for future work and best practices discussions relevant for progressing with security for OGC Web Services. The identification of CRs on one hand is based on the disconnect of OGC Web Service specifications from mainstream IT as outlined in OGC 15-022 which limits the options to be interoperable for secured services. To close the gap is the main objective behind the identified CRs. In OGC W*S specifications, if they support HTTP POST, the content-type is “text/xml” or “application/xml” or similar. This does prevent a simple HTML5 document including a FORM element to submit a XML encoded request to a W*S.
The CR does identity the main limitation regarding security as follows: For a secured W*S endpoint, some authentication methods (e.g. SAML) that store a security context at the service side require a two-stage communication from the client to the service to establish the session. In stage one, the service returns to the client a temporary session which gets completed during stage two. It is therefore important that the client can point to the previous (incomplete) session. The SAML implementation Shibboleth triggers the second stage by returning an HTTP status 302 (for a HTTP Get request) or 307 (for a HTTP Post request) to the client. The reference to the preliminary session is done via extra parameters. But, the current way OGC POST requests work, it is not possible for the service to add specific parameters, as the structure is defined by an OGC maintained XSD and the content-type must be text/xml or application/xml. Due to that limitation, it is not possible to establish a session with W*S using a POST request, which is a shortcoming that introduces a disconnect from main stream IT, where almost all client/service interactions via POST use the content-type application/www-form-urlencoded. This requirement is important to enable that a security facade can be setup in front of any W*S to require the use of HTTPS. Also, the support of HTTPS, as standardized in the IETF RFC 2818 (HTTP over TLS) must become a normative reference. The use of OWS Common limits the binding of OGC Web Services to HTTP. However, secured endpoints that require confidential transport of request and responses are leveraging HTTP over TLS (HTTPS). But the OWS Common schema limits the use of the DCP subtype HTTP which indicates an unsecured communication channel. The OWS Common Schema must be extended to support HTTPS to indicate a secure use of HTTP per TLS. The ability - in general - to support HTTP Cookies ensures that it is possible to store state on the client side, including a reference to a security context stored at the server side. The support for HTTP Cookies in a service instance is optional and mainly depends on the security policy for your site. A WPS can be deployed to operate as a facade (or proxy) in front of backend services. According to the W*S type of the backend service, a request can be either HTTP Get or Post. In cases where the WPS process has received an XML encoded request for the backend service, it is important that the request is not processed but just relayed to the backend service. This is important in cases where the backend service is a SOAP + security enabled service and the client submits the request to that service via the WPS Execute request. In case where a digital signature is on that request, any processing at the WPS would invalidate the request and the backend service would return an error. An example for this constellation is captured in chapter 11. As outlined in the ER in an earlier section, the WMS 1.1.1 capabilities are not based on OWS Common schema but on a WMS version specific DTD. In order to annotate the security conditions according to the proposed formalism, the following DTD structure must be included inside the VendorSpecificCapabilities element. For WMS 1.1.1, Only DCPType HTTP is allowed and because the proposed solution below is meant to be backwards-compatible, the proposed DTD element is X_HTTP and not HTTPS. For annotating WMS 1.3.0 capabilities with security annotations, the following XSD structure shall be used. The following schema defines the ExtendedSecurityCapabilities element which is in the substitution group _ExtendedCapabilties and can therefore be used in the capabilities document either exclusively or in combination with other extended capabilities elements. The example in a previous section of this ER outlines an example for a DigitalGlobe WMS 1.3.0, but the approach would also be valid for an INSPIRE download service. The proposed extended security type is compatible with WMS 1.3.0 and therefore leverages the DCPType HTTP even for service endpoints that are actually HTTPS. The use of security annotations in the Capabilities document (response) is based on well defined URNs with pre-defined meaning. In order to achieve an interoperable approach, certain URNs must be approved by the OGC Naming Authority. URNs must be re-defined by the OWS Common - Security SWG before submitted to the OGC Naming Authority. Also, the URL location of the Authentication Codelist must be specified by the OGC Naming Authority. The URL is important to allow clients the resolving of the identifiers used in the Authentication Codelist. Ensuring backwards compatibility, it is not possible to use another DCP type than HTTP. In order to outline the use of HTTPS, the allowed codes shall be listed as possible allowed values for Integrity and Confidentiality. For example SSL3.0, TLS1.2, etc. URL must be re-defined by the OWS Common - Security SWG before submitted to the OGC Naming Authority. The actual identifiers for the different authentication schemes that comprise the authentication codelist must be approved by the OGC Naming Authority. The actual values of the URNs used in Testbed 12 cannot be used for an Implementation Specification. The OWS Common - Security SWG must define the URNs and submit them to the OGC Naming Authority. The W3C CORS recommendation shall be adopted on the server side to ensure that OGC Web Service requests, where XML encoded responses are expected (e.g. GetCapabilities, DescribeFeatureType, GetFeature, etc.) are not blocked by the Web Browser due to a different Origin. The topics listed here are important to be considered when implementing clients that shall be able to work with secured services. The list of topics is not meant to be complete, because only topics arising from Testbed 12 are captured. Because OGC has not released Client Implementation Specifications, the topics listed here cannot be captured as a Change Request! For any client application that shall be used on a secured service, it is important that the implementation supports HTTP over TLS (IETF RFC 2818). This support requires the use of modern and strong ciphers (TLS 1.2) and refrain from using weak ciphers such as SSL 3.0. Further more, it is important that server certificates are properly introspected and certificate revocation lists are used when validating certificates. The use of OWS Common limits a W*S to be stateless. This is acceptable for unsecured services, but when applying a particular security technology or standard, it must be possible that a client refers to a security context via an HTTP Cookie. OWS Common has a mandatory reference to IETF RFC 2616, which is HTTP 1.1. Even though client specifications do not exist, all client implementations must support proper functions for all HTTP status codes, including 302 and 307. This is important when enterprise security authentication is implemented at the service, as it is defined in e.g. SAML2. Also, the appropriate use of all HTTP verbs is encouraged, including the use of HTTP OPTIONS and HEAD operations. The WFS returns an XML encoded response for the GetFeature operation; the FeatureCollection. In order for the receiving application to validate the XML, a schema is required. General practice is to refer to the schema of the FeatureCollection using the WFS DescribeFeatureType operation. But for a secured WFS where the schema is sensitive and not publicly accessible, the client side XML parser cannot simply use the DescribeFeatureType operation, as this is a secured operation. The general question is how can the XML parse execute the secured operation DescribeFeatureType without unveiling the credentials required for this operation? For any W*S instance that supports SOAP and enforces security conditions on the SOAP envelope, no HTTP GET operations must be used. The main reason is that the security conditions for the SOAP envelope (typically described in a WS-Policy) can not be modeled in a HTTP GET request. It is therefore not possible that e.g. a WFS supports a DescribeFeatureType via HTTP GET in cases where this operation is also protected via SOAP security. Therefore, the general question is how to enable the client side parser to obtain the schema without following the DescribeFeatureType link outlined in the XML response; the FeatureCollection? The main contribution from each TB12 participant that puts security on a service is to verify if the deployment is OGC standard-compliant and if not, what the delta is with respect to compliance. For TB12, Secure Dimensions has deployed various security facades to secure otherwise unsecured services from different TB12 participating organizations. The following sub-sections summarize the secured services contribution from Secure Dimensions. The TIE results from these endpoints using annotated public capabilities is documented in the following chapter. For securing services from DigitalGlobe, the security architecture is very much identical to the security model from DHS (Department of Homeland Security). In a nutshell, the architecture involves user authentication via personal certificates, issued for TB12 from OGC and Secure Dimensions. The service endpoints are secured with client side TLS which requires the user to select his TB12 certificate to establish a TLS connection. With the CN from the certificate, the security facade requests user attributes from a SAML Attribute Authority, which is operated by OGC for TB12. From that user repository, a set of different user attributes becomes available for undertaking the authorization. In particular, the security implements the OASIS SAML Profile “SAML Attribute Sharing Profile for X.509 Authentication-Based Systems”. The access control itself is based on GeoXACML policy based authorization which involves geographic conditions for military installations and otherwise sensitive areas. Nike: This is a small military installation. 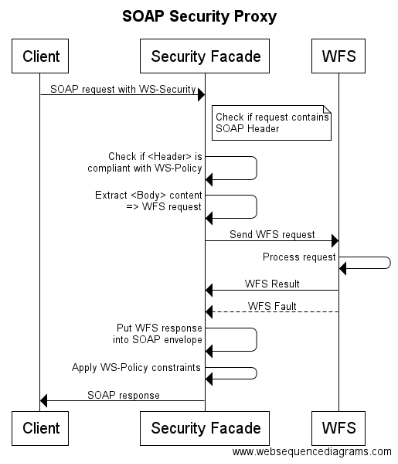 For Cubewerx, a WFS 2.0 with SOAP support is secured using a SOAP+WS-Security as described in a WS-Policy. In order to execute the secured service, the client must send a particular security header inside the SOAP envelope which matches the requirements from the WS-Policy. For rasdaman, a WCPS security implementation exists which connects to a rasdaman WCS 2.0.1. The security is based on HTTPS and Basic Authentication. Based on the user’s identifier, the security proxy does rewrite POST requests from a client with the following effects. Alcatraz: For all users that are not allowed to see Alcatraz, a water color blend-over is applied. Armory: For all users that are not allowed to see Armory, the military installation is covered by a football field. Nike: For all users that are not allowed to see the Nike installation, other coverages showing wood are blend-over the actual launch pad locations. The service instances are hosted on HTTPS endpoints. Therefore, the client must have implemented support for IETF RFC 2818. The use of HTTPS is a problem as not many GIS desktop clients support this. This is caused by the fact that the OGC Web Service suite of standards does not mandate the implementation of HTTPS. A change request to OWS Common is required to ensure interoperability. The use of client side certificate, as one option in the TLS RFC to establish a secure connection, reduces the stack of available clients dramatically. For connecting to WMS and WMTS, ArcMap can be used. But QGIS does not support HTTPS + client side certificate. The service endpoints create (secure) cookies to enable the client to reference a security context, stored at the service side. The OGC Suite of Web Service standards does not mandate the client to support HTTP cookies - actually, an OGC Web Services is supposed to be stateless. A Change Request to OWS Common is required to enable interoperability for HTTP cookies. ArcMap successfully supported the use of HTTP cookies. The use of HTTP Basic Authentication - whether over HTTP or HTTPS - typically does work with clients, as the network libraries typically support this feature. 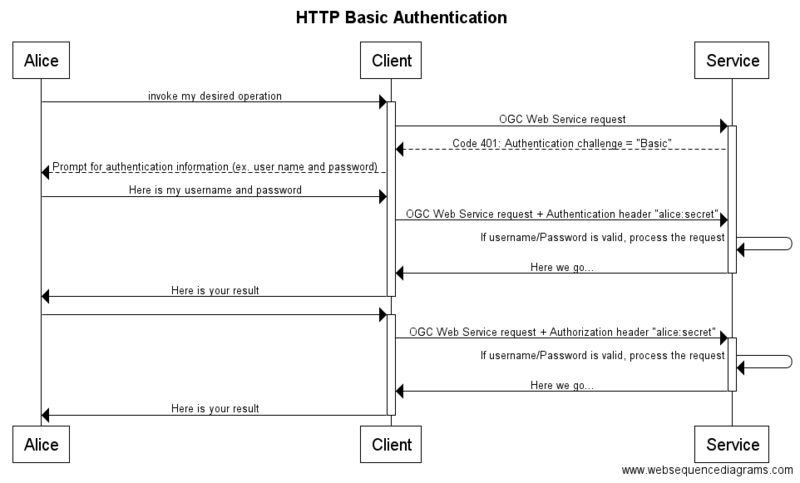 However, the Suite of OGC Web Services standards does not mandate support for HTTP Authentication. 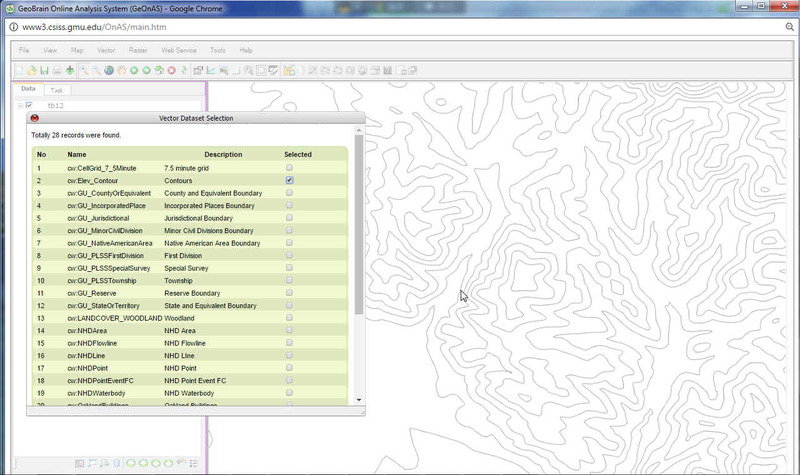 The use of HTTP Basic Authentication was successfully demonstrated with QGIS and ArcMap. The following listing contains the XML encoded WPS Execute request that can be sent to the WPS process to execute the secured WFS. Please note the WS-Security specific elements in the Header element of the SOAP request. For TB12, Cubewerx has provided a set of secured services via the Cubewerx CwAuth and HTTP Basic Authentication. The endpoints got challenged in different TIEs to evaluate the security annotation. Cubewerx did also participate with their Web Browser based client to conduct TIEs. The result of the TIEs is captured in a later subsection. For TB12, Compusult has not provided secured OGC Web Services. Their security related contribution for TB12 is conducting TIEs with their client product. 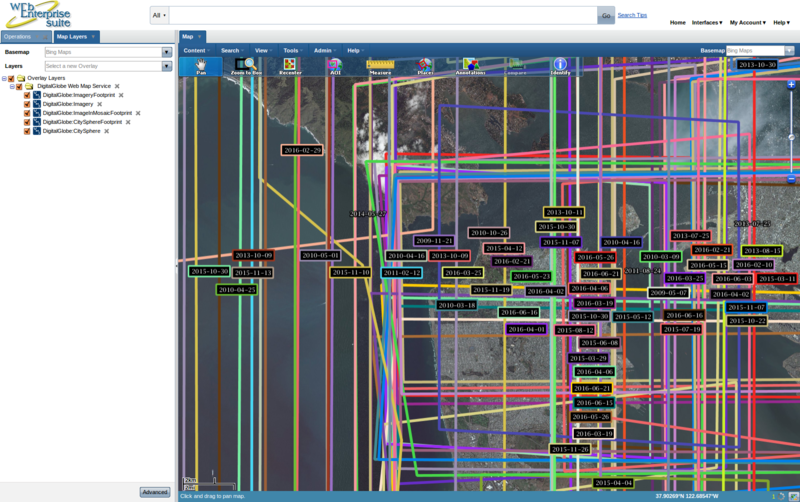 Client: Client (desktop) GIS Based Capabilities URL: https://tb12.ogc.secure-dimensions.com/capabilities/WMS-1.1.1.xml Result: The client was able to successfully load the annotated WMS public capabilities, and add the layer. 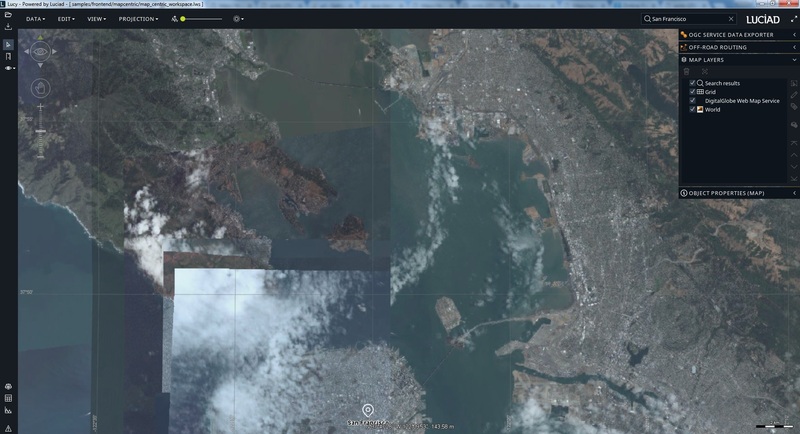 DigitalGlobe:CitySphere to the map. The certificate for user “dbrown” was chosen when prompted by the browser. Client: Client (desktop) GIS Based Capabilities URL: https://tb12.ogc.secure-dimensions.com/capabilities/WMTS-1.0.0.xml Result The client was able to successfully load the annotated WMTS public capabilities, and add the layer. DigitalGlobe:CitySphereTileService to the map. The certificate for user “dbrown” was chosen when prompted by the browser. Client: Client (desktop) GIS Based Capabilities URL: https://tb12.cubewerx.com/a042/wmtsCapabilities.xml Result: The client was confused by the presence of both SOAP and KVP encodings, and initiated a SOAP request, which failed. Investigating possible ways for the client to mitigate this situation. 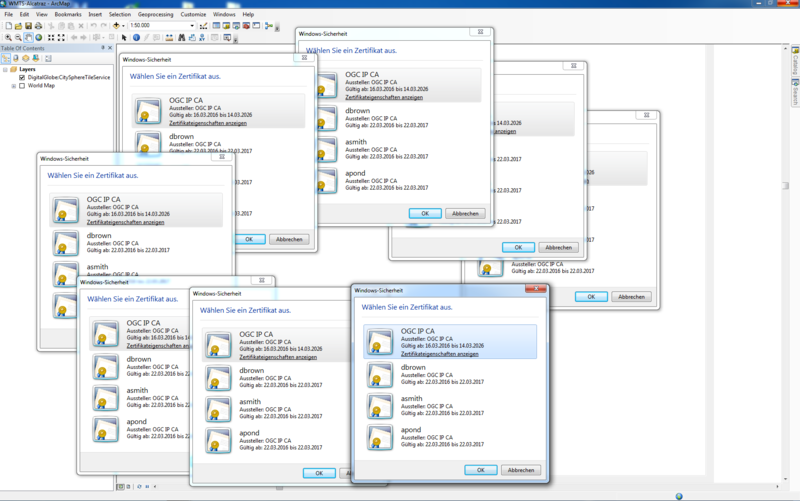 The following screenshot illustrates successful TIE with the secured WMS from Digital Globe. User credentials in server-side requests: Because the requests for map layers are invoked by the web client, the browser is able to prompt the user for a certificate and retrieve the map layers. However, there is still the situation where server-side code may want to submit a request to the WMS/WMTS. Because this request is not made from the browser, the server-side code will need to inject user credentials into the request in order to retrieve data as that user. The alternative is for the server to use its own credentials (e.g. certificate in the server keystore) when making the request. This may be a suitable workaround for a testbed event, but a production-level system will need to resolve the issue of reconciling user credentials with server-side requests. Negotiating between multiple bindings: In the case where multiple bindings (encodings) are supported by a service (e.g., SOAP and KVP), the client code must decide which one to use. If the client makes the wrong choice, it may lead to errors in the client. (e.g., if a client supports SOAP only for a subset of operations.) Clients will need to be coded to automatically negotiate an encoding, or pass the decision back to the user in the form of a prompt. One solution is to allow the client to decide, but provide a means for the user to override the decision. In the case of adding a layer to a map, this could be presented as a drop-down list of available encodings. For TB12, Luciad conducted TIEs with their client product and different secured services. All TIEs were successful reading the annotated capabilities and displaying the service response. 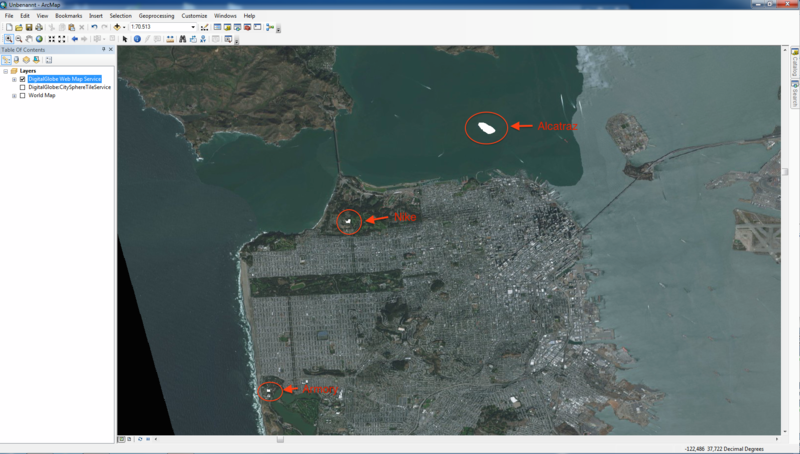 The following screenshot illustrated the TIE result with a WMS 1.1.1 from DigitalGlobe via a Secure Dimensions security proxy. Luciad performed a set of security TIEs using its Java-based Desktop Client, which has been developed to support the Field Operations thread. Security-wise, the client supports HTTP Basic Authentication and HTTPS SSL/TLS authentication using certificates. The client tested against WMS, WFS and WMTS services with security-annotated capabilities and using KVP/XML bindings. 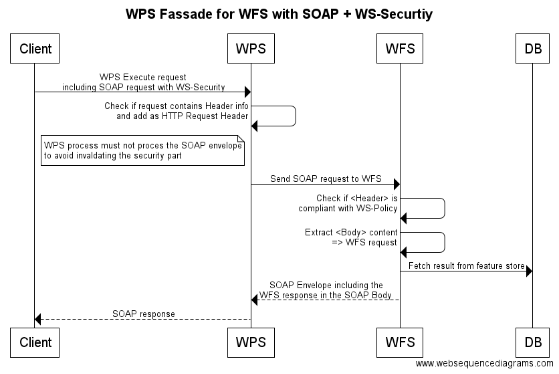 A test with a SOAP-based WFS was not performed, due to the lack of proper WS Security support in the client. The tests showed that the client was able to decode the capabilities without any issue, demonstrating the backwards compatibility of the security annotations. Querying and visualizing the data was also successful, apart from one interoperability issue related to the handling of a "not authorized" response encoded as an image (served by a WMS); the client was not able to display this image, due to a missing & appropriate mime type in the Content-Type header. In order to determine backwards compatibility with existing clients for the annotated capabilities, TIEs where conducted. The objective of the TIEs is to determine whether an existing client - which is naturally not able to understand the security annotations in the capabilities document - does (i) crash when loading the annotated capabilities or (ii) connect to the protected service, ignoring the security annotation(s). As a summary, it can be concluded that ALL tested clients did NOT crash when processing the annotated capabilities! This proves the proposed use of annotated capabilities as backwards-compatible, with at least the tested clients. The result of loading the annotated capabilities did not result in a crash of the client applications. After selecting a layer, the client application did load the map and displayed it with no error. In order to have the client execute the GetMap request for the first time, the user must select the client certificate to establish a TLS connection. The result of this TIE is identical as if the client had loaded the capabilities via the protected service endpoint using the GetCapabilities operation. The result of loading the annotated capabilities did not result in a crash any of the client applications. 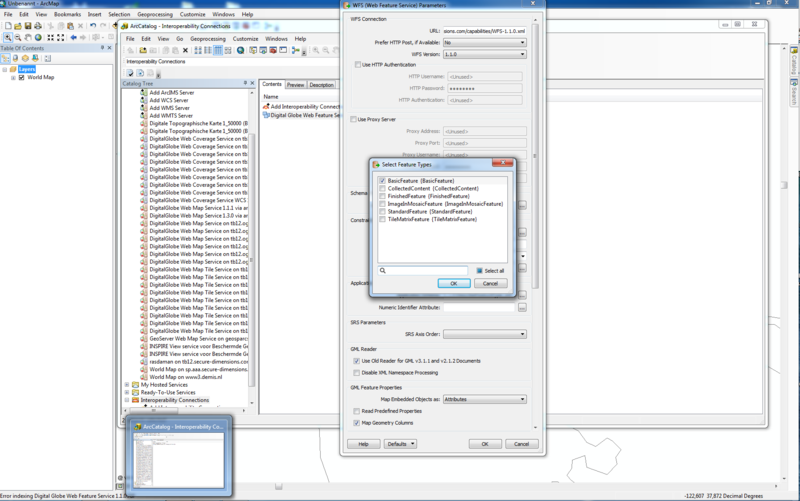 However, after selecting a layer, the ArcMap 10.2.2 and 10.4.1 applications open multiple network connections in parallel to load the tiles via the GetTile request. At that point, the underlying network library causes popup boxes to appear asking the user to select a client certificate to establish the TLS connection. After the second popup box is processed by the user - selecting the certificate - the application crashes. This problem was reported to ESRI via the proper channels. The crash is not related to the use of annotated capabilities, as the same crash occurs at random (3 of 5 attempts) if a project file /.mxd file for the WMTS is used to connect to the service. The cause for the crash is the parallel connections for loading tiles. WMS works, because only one single GetMap request is issued and therefore only one popup box occurs. When using the secured endpoint of the service (https://tb12.ogc.secure-dimensions.com/service/wmts) ArcMap connects to the service via the GetCapabilties request which causes the popup of the certificate selection box. Once that single request has resulted in a TLS connection, the parallel requests for GetTile do not require a certificate selection any more. So, the application works as expected. It was possible to create an Interoperability Extension for the WFS using ArcCatalog. The annotated capabilities document was loaded with no crash. It was also possible to select a feature type and save the configuration in ArcCatalog. The loading of features from this interoperability connection in ArcMap 10.2.2 failed. 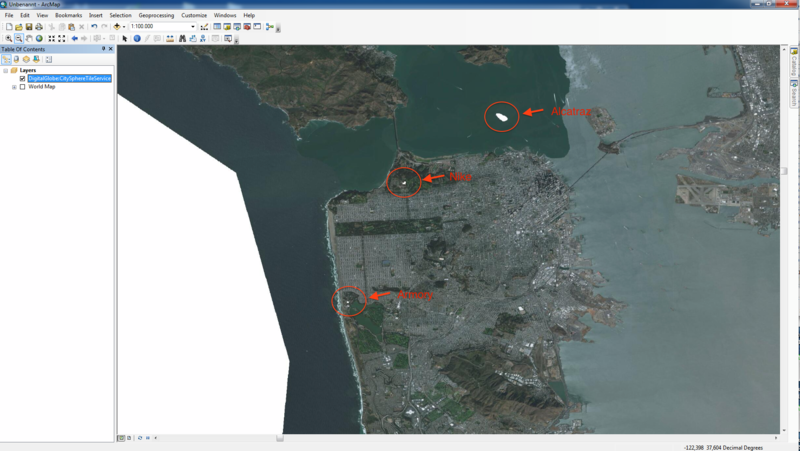 The loading of the annotated capabilities and displaying of the result did work for the Luciad desktop GIS and the Compusult WIS. The result of the TIE is that the use of the annotated capabilities did not crash the client application. But the lack of support for the client side TLS caused the ArcMap client not to load any features. It was possible to load the annotated capabilities files without crashing the client. 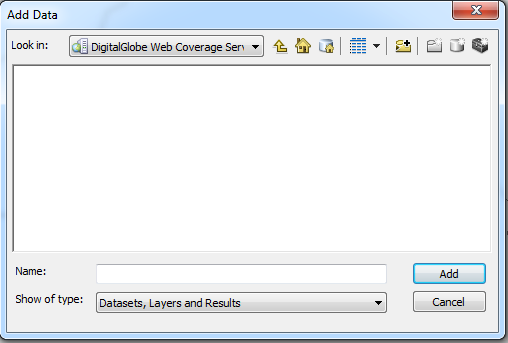 But the client did not issue a DescribeCoverage request and the selection box remained empty. The result of the TIE is that the use of the annotated capabilities did not crash the client application. But for an error in the capabilities document, it was not possible to select a coverage. 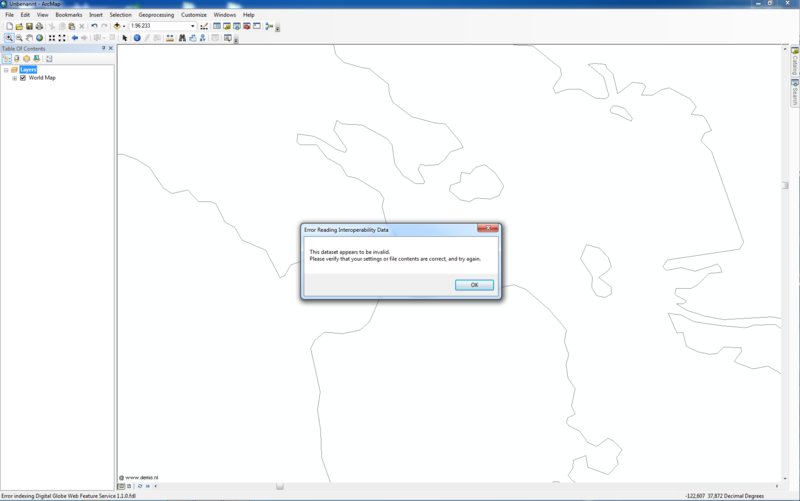 1: ArcMap crashes - to the opinion of the tester - due to a bug in ArcMap. The bug was reported to ESRI thru the proper channel: Crash Reporter. 2: The selection of Coverages is empty. 3: The selection of Coverages is empty. 4: The client was confused by the presence of both SOAP and KVP encodings, and initiated a SOAP request, which failed. Investigating possible ways for the client to mitigate this situation. This section lists all protected services from TB12 that have public capabilities with security annotations and are accessible online.